Before Agatha Christie became the world’s Queen of Crime, she stood on the talented shoulders of the female crime authors who came before her. This splendid new anthology by Leslie S. Klinger brings these exceptional writers out of Christie’s shadow and back into the spotlight they deserve. Agatha Christie is undoubtedly the world’s best-selling mystery author, hailed as the “Queen of Crime,” with worldwide sales in the billions. Christie burst onto the literary scene in 1920, with THE MYSTERIOUS AFFAIR AT STYLES; her last novel was published in 1976, a career longer than even Conan Doyle’s 40-year span. The truth is that it was due to the success of writers like Anna Katherine Green in America; L. T. Meade, C. L. Pirkis, the Baroness Orczy and Elizabeth Corbett in England; and Mary Fortune in Australia that the doors were finally opened for women crime-writers. Authors who followed them, such as Patricia Wentworth, Dorothy Sayers and, of course, Agatha Christie would not have thrived without the bold, fearless work of their predecessors --- and the genre would be much poorer for their absence. 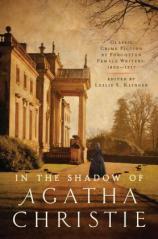 So while Agatha Christie may still reign supreme, it is important to remember that she did not ascend that throne except on the shoulders of the women who came before her --- and inspired her --- and who are now removed from her shadow once and for all by this superb new anthology by Leslie S. Klinger.